The South Hebron Hills, sweltering in 34C heat and in its second consecutive year of drought, is a landscape of brutal contrasts. There is enough water here to support lush greenhouses, big cattle sheds, even ornamental plants. It arrives in large, high-pressure lines. And there appears to be no limit to the bounty it can bring. Cheek by jowl with the water towers and red roofs of the Israeli settlers in this area of the West Bank is a landscape of stone boulders, tents and caves. The Palestinian village of al-Amniyr looks from afar like a rubbish tip until you realise that the rubbish is people’s dwellings, which have been destroyed in attacks targeting their water cisterns. The villager Mohammed Ahmad Jabor’s water cistern has been destroyed three times this year. The last time was by the settlers. The settler attacks come generally at night and where they cannot destroy water cisterns they poison them by putting chicken carcasses in them. The second time Jabor’s cistern was destroyed was by Israeli soldiers who destroyed seven tent dwellings and a sheep pen. Jabor has gone to the Israeli courts repeatedly, which have upheld his and fellow villagers’ ownership of the land, a title he claims that dates back to Ottoman times. But the ruling of the court has had no effect either on the determination of soldiers and settlers to stop anyone or any animal living in al-Amniyr. The land has been declared as agricultural, a designation which prohibits residents from constructing structures of any kind, especially cisterns. Constructions need permits, which are all but impossible to obtain. Where they are obtained, it is in areas such as quarries, which are impossible to exploit. And under another law, if the land is not used for three years, it reverts to Israel. So the inhabitants of al-Amniyr, at-Tuwani and the other villages that comprise Susiya, are faced with a catch-22. If they comply with the law they cannot build cisterns and collect even the rainwater. But if they fail to use their land agriculturally, they lose it anyway. “We are without tents and without water, so how can we live here?” Jabor asks. Walking past the roots of a ripped-up olive grove – the replacement seedlings are already planted – Jabor answers his own question. A blue plastic sheet in an entrance to the rock, conceals a heavy, metal door. Beyond lies a cave, complete with a crying kitten, chickens and a metal stove for the winter. This is home for him and his seven children. Most villagers date the start of their battle over water with Israel to 1982, when Ariel Sharon, then minister of defence, transferred all the West Bank water systems to Mekorot, the Israeli national water company for the nominal price of one shekel. The Oslo accords created a Joint Water Management Committee, which grants Israel a veto over water resource and infrastructure in the West Bank. The committee issued a joint declaration in 2001 “for keeping water infrastructure out of the cycle of violence”. The Emergency Water, Sanitation and Hygiene group (EWASH), a multinational consortium of NGOs funded by the European commission, accuses Israel of breaking this declaration, although there is a long list of other obligations under humanitarian law as an occupying power. In the past two years, it has logged the destruction of 100 water, sanitation and hygiene structures, 44 cisterns, 20 toilets and sinks, 28 wells. This year alone, 20 cisterns have been destroyed. Most of this is happening in Area C, which is under full Israeli military control. The effect of the water shortage on the Palestinian population is not disputed. The average use of water by Palestininians is 50 litres a person a day for domestic purposes, one-fourth of the Israeli use. Rates of diarrhoea are high, particularly among children in herder communities. One survey found that 44% of children between six months and five years had diarrhoea in the two weeks before. Bodies such as the World Bank, UNRWA, Unicef and the World Food Programme have all carried out studies on it. Where Palestinian villages are permitted, villagers complain of weak water pressure or the high price of tankered water. 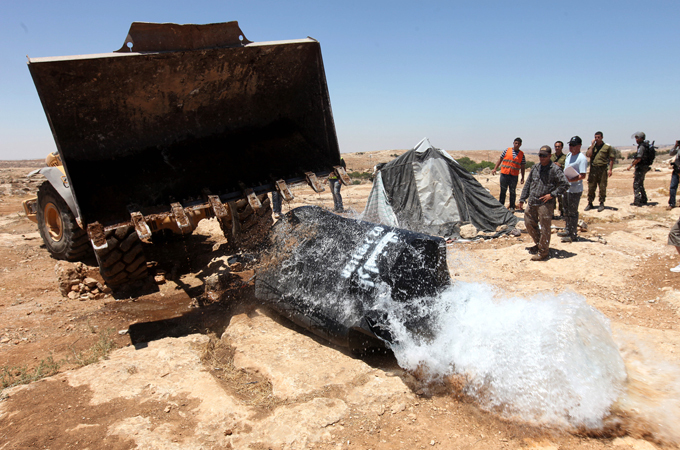 In Susiya it comes in at 35 shekels a cubic metre. The Palestinian Water Authority issued a statement in May this year condemning the demolition of cisterns as a violation of numerous bilateral agreements and declarations between Israel and the PLO as well as between Israel and the Palestinian Authority. Israel disputes it is responsible for the unequal distribution of water in the West Bank, and accuses Palestinians of letting untreated sewage flow into the water table and of lowering the level of table with unauthorised wells. It said that under Oslo accords water resources were divided between Israel and the PWA, each side was held responsible for the water it consumes and a bilateral committee was set up as a mechanism to monitor the use of water and approve new projects. The last time the bilateral committee met 65 new water projects were approved, mostly for the Palestinians. The Israeli embassy in London said: “Unfortunately there is a limited supply of water in the region. This is the fairest system for allocation through a bilateral committee.” He called reports about Israeli settlers poisoning the water supply of palestinians “unacceptable behaviour” and was by no means government policy. Asked about the use of water by Israeli settlers, he said that as they paid for it, it was up to each individual how they used it.